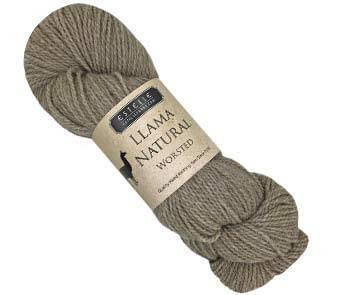 Llama Natural Worsted from Estelle Yarns is a Merino and Llama blend that is available in 8 naturally undyed shades. It is extremely warm and soft due to the Llama fibres, and makes stunning sweaters, hats, scarves and mittens. Llama is one of our latest arrivals from last Fall and deserves a bit more attention. Starting on January 13 (at 19:00 of course) until Januar 31 we offer you a 19% discount in-store as well as online. Rainchecks will be given if we run out of stock in between. The Finial Cardigan, designed by Michelle Porter, is a free pattern from Estelle Designs for Llama Natural Worsted. This yoked cardigan is worked top down and features a combination of lace and cables to form the motifs. The pattern is offered in six sizes with a standard fit of 5-10 cm positive ease. Click on the photo to download the pattern!